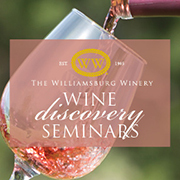 Join us on Thursday, September 12th at 6 PM at the Williamsburg Winery Tasting Room and Wine Bar in Merchant's Square for an evening of wine education and exploration. This month's seminar will focus on Virginia's most planted red varietal, Cabernet Franc, with examples from classic growing regions around the world. Several small bites will accompany this tasting.